CBS is especially proud of Anders Vad Dons and wishes to honour him as this year’s Distinguished Alum for many reasons. 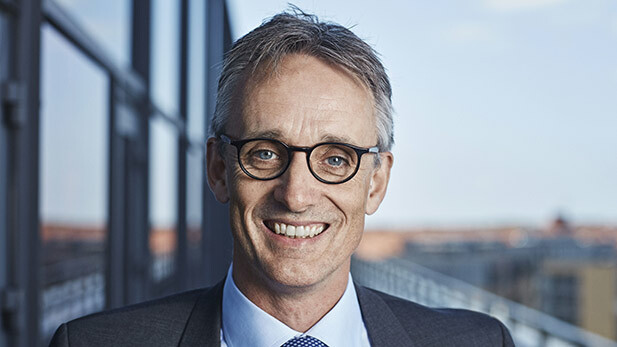 One of them is his outstanding career, where he has worked almost exclusively in Deloitte’s global auditing and counselling group, a position that propelled him to the upper echelons as the company CEO in Denmark six years ago and then as CEO in the Nordic region in 2016. These accomplishments also come in the wake of Anders Dons having been a member of the Deloitte Global Board of Directors for many years. Anders has also been chosen as a result of the endeavours he undertakes serving to encourage social responsibility in various areas that align with CBS’ values and strategic focus on sustainability. He actively works to promote diversity at Deloitte and is a key player in Deloitte’s strong commitment to initiatives aimed at realising the UN Sustainable Development Goals. Moreover, he is personally involved in the Small Great Nation initiative, which focuses on strengthening Denmark’s position in growth, digitalisation and globalisation through fact-based dialogue and debate. - CBS means a great deal to Deloitte and, as our key source of talents, is an extremely vital partner in our ecosystem, which is why the school’s prosperity is highly important to us. I’ve been a big user of CBS, where I earned an MSc in Business Economics and Auditing and received two business administration diplomas. I’m proud of CBS and of being one of its graduates. It means so much when a community that you’re proud of is proud of you. A year and a half ago, Dons put gender diversity at the top of Deloitte’s agenda, just as the group’s global CEOs also had a focus on gender parity. These efforts have given significant momentum towards addressing gender inequalities at Deloitte worldwide. In this regard, Dons’ only concern is that the change is not happening quickly enough. - Diversity is close to my heart and takes up a lot of space on my personal agenda. When you look at entry level positions at Deloitte, gender distribution is almost equal. But a significant gender gap occurs in the years approaching partner level. It’s something we must and can do something about. That’s why we focus on avoiding unconscious bias in the organisation to ensure that we appoint and promote more than just people similar to ourselves. Deloitte’s diversity agenda also encompasses other areas. Recognising that one size does not fit all, Deloitte seeks to adapt and acknowledge that today’s young people have another approach to flexibility by allowing them to take time out during their career or to change priorities when they become parents. - We are constantly working to become better at establishing a framework that takes the individual into consideration, where we take good care of our employees, give them the right mentors and ensure that their career path is based on solid personal insights, so we make room for more than just the most outspoken and energetic people. Our team needs to be more diverse than that, emphasises Anders. Anders Dons, who comes from a large family, has five children and believes that this has given him a team mindset. As team player by heart, he is convinced that creating things together is best – and that a team’s diversity increases its strength and capabilities. According to Anders Dons, integrity is a key value at Deloitte, which is grounded in the motto: “What you can explain, you can defend.” With this in mind, engaging in and trying to affect broader societal agendas such as the UN’s SDGs is a natural progression. - More and more top executives believe in doing well by doing good, which is a very positive development, especially because the private sector plays a crucial role in achieving the UN’s SDGs by 2030. For this reason, it’s imperative that we participate in promoting the UN’s agenda, asserts Dons. As a result, Deloitte has actively engaged in the SDG Accelerator programme, helping small and medium-sized companies develop sustainable solutions or products. Deloitte became an active partner in the world’s biggest innovation workshop, UNLEASH 2017, for the same reasons. UNLEASH is a global, non-profit innovation laboratory for small and medium-sized companies aimed at realising the UN’s SDGs. - We gathered a thousand young talents from all over the world in Denmark and sent them on a one-week folk high school with some of our best consultants, who then helped them convert their SDG solutions into products and services capable of implementation. It was such a great success that we repeated the concept in Singapore in 2018 and will do it again in China this year, explains the distinguished alumnus. Finally, Anders is heavily engaged in the Small Great Nation initiative, which is realised in a collaboration between Deloitte and the private, independent socio-economic think tank Kraka. Small Great Nation has set out to publish a variety of dense, data-based reports about Denmark’s future strongholds, which will then be used to drive and generate the discussion at conferences, roundtables, in the media and through various podcasts, most of which Anders himself has participated in. - I’m incredibly proud of Denmark and believe that the world can learn a great deal from us – and of course vice versa. With our excellent starting point as a well-functioning society with a value-adding public sector, I would like to start a debate about our future based on data and facts, in contrast to the populist approach, explains this year’s distinguished alumnus. For the same reasons Deloitte has globally established the WorldClass initiative, which will ensure that 50 million people have a good future through access to education and by developing useful skills. We need to get everybody on board, which is a statement that fundamentally represents what CBS Distinguished Alumnus 2019 Anders Vad Dons stands for.